FOLLOWING IN HIS FOOTSTEPS: North’s Andrew Swallow runs off brother David, of the Gold Coast, during their teams’ clash at Etihad Stadium last year. WHILE both now sit comfortably among the competition's elite, brothers Andrew and David Swallow have taken vastly different paths into the AFL. As the most promising prospect of his age in the country, then 16-year-old David was enticed to the Gold Coast from his family home in Perth, before the new franchise selected him with its very first pick - No.1 in the 2010 national draft - 12 months later. In 2004, Andrew was unwanted by every club the first time he entered the national draft, forcing to play in the WAFL and work in a local travel agency while waiting for his next chance. Fortunately for him, he was not passed up again, North Melbourne drafting him in 2005. 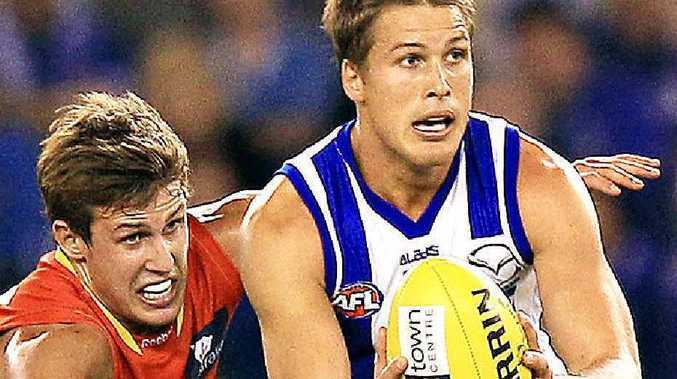 "I suppose getting overlooked in my first year was tough because my dream was to play AFL," said the now 26-year-old Andrew, who became the Roos' captain last year and has played 139 games for the club. "But I suppose I learnt a lot of great lessons out of it and went back and had to really work for it. "David got a bit of an easier ride into the AFL, but that's obviously because he's super-talented and does have an extremely high work ethic. "I remember watching him in an under-18s (national championships) game at Etihad (Stadium) ... he was just 16, a bottom-ager, but to see him really dominate the game, that was probably the time I thought 'he can really play this kid'." Putting aside their numerous battles in the backyard, the Swallows will clash for the fourth time on the big stage tonight when Gold Coast hosts North at Carrara. It is a bit more of an even playing field these days. "I remember playing them at Etihad last year and getting a couple of contests going with him and a couple of bumps ... it was a bit of fun," Andrew said. "We're five years apart, so when I left home at 18, Dave was only 13 - he was still pretty young and small, but he's bigger than me now." Andrew, who speaks with David on the phone most weeks, doesn't deny he would still love to one day actually play alongside his brother. "We never had a chance to do that, which is a bit of a shame," he said. "I suppose, for me, I would love for that to happen, (but) we are both locked away (on long-term contracts). When you do get drafted, they invest so much time in you, and I know exactly what he would be feeling like - he would want to give back to the club. "Maybe down the track we might be lucky enough for it to occur, but it's just one of those things where we'll just have to wait and see." Today, David will be just another Gold Coast Sun in the way of a win the Kangaroos desperately need after a 4-6 start that has included four losses by four points or less. The Roos would take comfort in the intensity and four-quarter effort they produced for a 68-point win over St Kilda last week, including a 61-6 opening term. "We really wanted to come out and make a statement," Swallow said. "It was good to play the way we did, but probably even more pleasing was when St Kilda started to come back we really held our nerve and played some good footy. Now it's all about trying to string a few of them together." While the Roos included Majak Daw, the Suns welcomed back their own promising ruck-forward, Charlie Dixon, to a side that lost to Geelong by nine goals but was level with the Cats at three-quarter time. "They've really come on," Andrew said. "They seem to have a lot of confidence in the way they are playing. A lot of the guys are playing the best footy of their careers. We know it is going to be a massive challenge."